As already announced in Ferry Shipping News (week 37), CMA CGM will launch a new ro-ro service to connect Morocco more quickly to Europe: Morocco Express 1/2/3. Loop 1: weekly service on a fixed day, available throughout the year. It connects Casablanca and Tangier to Marseille with 3 departures per week from Morocco on a ship with a capacity of 180 trailers. Loop 2: weekly service on a fixed day, available throughout the year. 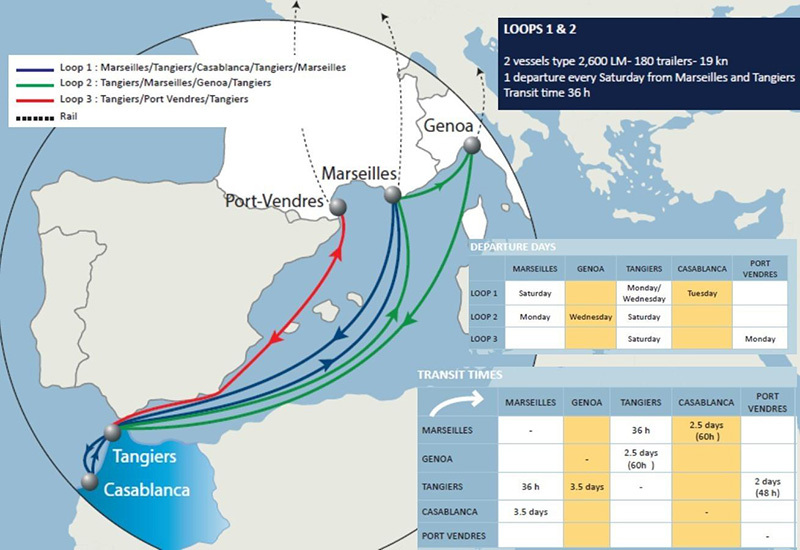 It connects Tangier to Marseille and Genoa with 2 departures each week from Southern Europe on a ship with a capacity of 180 trailers. Loop 3: weekly service on a fixed day, available from November to April. It connects the port of Tangier to Port-Vendres with 1 departure per week from Tangier on a ship with a capacity of 65 trailers. The service will start on October 21.